ESLyric is a foobar2000 lyric component coded by ttsping ( @ohyeah ). - Search lyrics from tags/local/internet, and can save it to local disk/tags. - You can write your own JScript to search/grab lyrics from internet. * A simple tutor(In Chinese...): here. var debug = false; // 如果要调试的话，改为 true. Elia, how did you add those lyric sources (2 * TTMusic, Kugoo, QQ, TTPod and others I can't see)? I only have the three Chinese websites by default and I added Syair. download the package and you will see a *.cfg file in it, put the cfg file in your foobar2000's configuration folder and restart then you will have those sources (except syair, you will have to add it by yourself again). and the "Chinese websites" are not websites at all, scroll down the plugin upload thread and you will find an english version, and some images. (eslyric would have both Chinese and English version in 0.4, which ttsping garenteed). Great plugin. Unfortunately it doesn't work with streaming sources i.e. radio, so it's not yet time to retire good old Lyrics Show Panel. could you show me one stream source which does not work? Just to let you know, there is something wrong with the Kugou source. The 2 TTMusic / TTPlayer sources are the same as Timestamped2b and 2c from foo_uie_lyrics3 v. 0.5. "Baidu music" and the 3 default Chinese-character websites don't work at all (no search over the Internet). So, I deactivated all of them. The second "Baidu music", Xiami, TTPod, QQ Music and Syair are functional. Kugoo had an updated version. Thanks for the information. Although requests to Kugou seem to be a bit better now, I still don't get results from the website. Maybe kugoo do not have lyric that you search. kugoo lyric service is provided by a company in mainland China and may not have lyrics that Chinese people do not interest. * blurred image background which use StackBlur instead of BoxBlur. (wsh_panel_mod_plus had added interface of StackBlur days before but not publicly released yet too). + Added “Tag search" & "Save to tag" settings - available by double-clicking ”Lyric Souce > Tag"
You can upload some updated scripts by tt or asion. “kgmusic v0.0.8” & “ttplayer v0.0.3” is a script for getting lyrics, which is based on the (ESL v0.3.5 beta1)'s interface. Installation: File > Preferences > Tools > ESLyric > Search > Add > Tools > Import. "krc_parser v0.1.2" is used to resolve the KRC format lyrics. It is used to work with “kgmusic v0.0.8”. Installation: File > Preferences > Tools > ESLyric > Search > Advanced > Add > Tools > Import. Outside of China, I'm not sure whether they can properly get the lyrics. But you can learn to write a script to get lyrics on the other server. for nobody report anything so I just do not know whether it is possible for people out of mainland China to download lyrics from the two source sites. yeah NeteaseCloudMusic works great using it for like 3 days now, but i'm not getting anything from ttpod. Great component. It's a lot smoother and has more features than LSPv3 especially as a local lyrics viewer. However is it possible to change the lyrics editor font? 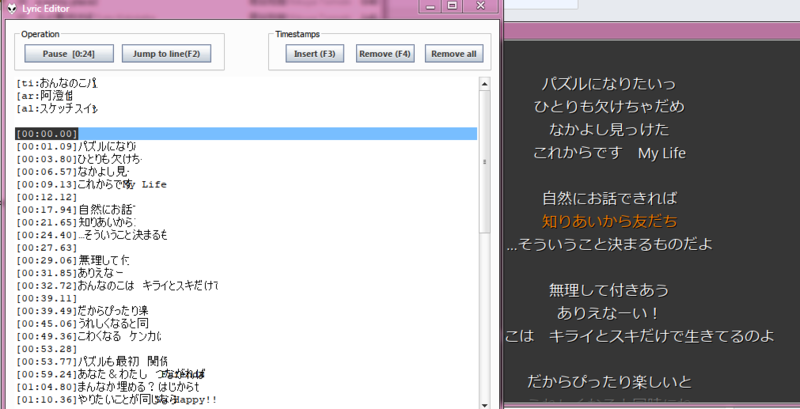 Currently it's in monospace and it breaks Japanese characters . Also is it possible to export/import panel preferences as well? I'll report it to ttsping. Thanks for making me discover ESlyric. Could someone write for me (and others) such a script with databases available for French and Italian lyrics ? I'm sorry but I am not familiar with the English or other western languages' net world. I just do not know from where do you usually download *.lrc files.